ST. PETERSBURG, Russia, July 17, 2013 (ENS) – So much for the lessons of Fukushima. Never mind oil spills, the Russian Federation is preparing an energy initiative that, if it has problems, will inject nuclear material into the maritime environment. The Russian Federation’s first floating nuclear power plant “should be operational by 2016,” Baltiskii Zavod shipyard General Director Aleksandr Voznesenskii told reporters earlier this month at the 6th International Naval Show in St. Petersburg, where the shipbuilding complex is located. According to Voznesenskii, the “Academician Lomonosov” FNPP will be the first vessel belonging to the new line of floating nuclear power plants that can provide energy, heat and water to remote and arid areas of the country. 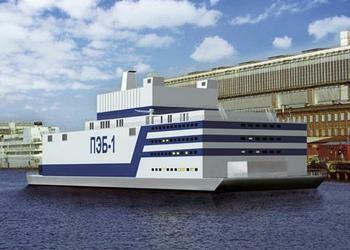 Mass production of similar floating nuclear power plants is scheduled for the near future. An added benefit of the FNPP as envisaged in Moscow is that the provision of nuclear power to the Arctic and Far East will free up more oil and natural gas for foreign export, allowing the Russian Federation to generate additional hard currency. But tow cables snap, Arctic conditions can be unpredictable, ships sink. As the ocean is the common heritage of humanity, perhaps the international community might evince more interest in this project.